we don't want one thread to hog, take or lock for too long a resource that other threads need in order to make progress. Code that is safe to call by multiple threads simultanously is called thread safe. If a piece of code is thread safe, then it contains no race conditions. Race condition only occur when multiple threads update shared resources. Therefore it is important to know what resources Java threads share when executing. Local variables are stored in each thread's own stack. That means that local variables are never shared between threads. That also means that all local primitive variables are thread safe. The only exception is of course, if one of the methods called with the LocalObject as parameter, stores the LocalObject instance in a way that allows access to it from other threads. Object members are stored on the heap along with the object. Therefore, if two threads call a method on the same object instance and this method updates object members, the method is not thread safe. The Java programming language provides two basic synchronization idioms: synchronized methods and synchronized statements. Note that constructors cannot be synchronized — using the synchronized keyword with a constructor is a syntax error. Synchronizing constructors doesn't make sense, because only the thread that creates an object should have access to it while it is being constructed. Since the state of the immutable objects can not be changed once they are created they are automatically thread-safe. How to create an immutable class? Set the values of properties using constructor only. Do not provide any setters for these properties. The synchronization wrappers add automatic synchronization (thread-safety) to an arbitrary collection. Each of the six core collection interfaces — Collection, Set, List, Map, SortedSet, and SortedMap — has one static factory method. Each of these methods returns a synchronized (thread-safe) Collection backed up by the specified collection. To guarantee serial access, all access to the backing collection must be accomplished through the returned collection. The easy way to guarantee this is not to keep a reference to the backing collection. Create the synchronized collection with the following trick. A collection created in this fashion is every bit as thread-safe as a normally synchronized collection, such as a Vector. In the face of concurrent access, it is imperative that the user manually synchronize on the returned collection when iterating over it. The reason is that iteration is accomplished via multiple calls into the collection, which must be composed into a single atomic operation. The following is the idiom to iterate over a wrapper-synchronized collection. A java.util.concurrent.locks.Lock is a thread synchronization mechanism just like synchronized blocks. A Lock is, however, more flexible and more sophisticated than a synchronized block. First a Lock is created. Then it's lock() method is called. Now the Lock instance is locked. Any other thread calling lock() will be blocked until the thread that locked the lock calls unlock(). Finally unlock() is called, and the Lock is now unlocked so other threads can lock it. A synchronized block makes no guarantees about the sequence in which threads waiting to entering it are granted access. You cannot pass any parameters to the entry of a synchronized block. Thus, having a timeout trying to get access to a synchronized block is not possible. The synchronized block must be fully contained within a single method. A Lock can have it's calls to lock() and unlock() in separate methods. What is the Java volatile keyword? Essentially, volatile is used to indicate that a variable's value will be modified by different threads. 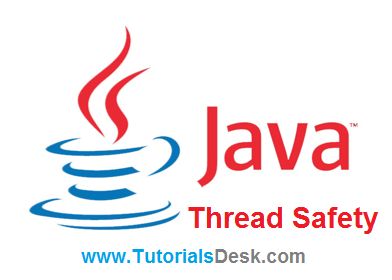 Hope we are able to explain you java synchronization and thread safety, if you have any questions or suggestions please write to us using contact us form. (Second Menu from top left).